‘Think Big’ is a powerful success mantra and managers across the globe are trained to think big and have a bigger vision to survive in this competitive world. However in India one really needs to think small in order to become big. It’s not only shampoos and washing powders, from cough syrups to corn flakes to Complan; brand managers are busy squeezing every product into packets and sachets to improve the sales in India. Small is a relative term, so while thinking small, one should also keep the target customers and market in mind. What’s small in US might not be considered as small in India. A small coffee in US is equivalent to a medium or big one by common Indian standards. Seeing the picture, if you thought the tea in the plastic cup is too small, hold your breadth, there’s even a one by two version of it available in most tea shops in rural India. It was only after serving the Indian markets for 10 long years; Cola giants took their first ‘small’ step by introducing the 200 ml bottle for Rs. 5 in 2003. It was an instant hit with the public and the Cola majors realized that this is not the ‘Yeh dil maange more’ market but a ‘Yeh dil maange small’ one. However they have not applied this small strategy to their take away packs like pet bottles or cans which are still available only in the 500ml and 330ml categories. Well, Colas might have started their life with glass bottles, but is it still worth to carry on with their first love? Moving from glass bottles to tetra packs or packets will be more convenient for the commuters as they can just a pick a pack and move on. And for companies they don’t need to invest in fountain machines to offer cola, on the go. Of course technology wise it will be a big challenge to keep the same fizz in the soda within a tetra pack, but it will be worth trying. People are more likely to consume colas during their travel on a typical hot day in India. But a look at the current scenario in railway stations and trains gives more reason to go for the ready to take pack than fountains or cans. 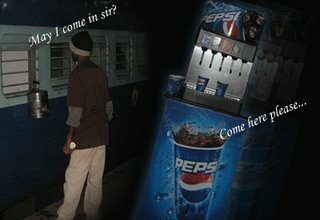 Coffee and tea are selling more in the stations as consumers are getting them right inside their cabin, thanks to the tea vendors, but one needs to jump outside to get a Pepsi or Coke. Cola companies can use these same tea vendors to sell their products along with tea and for the vendors, it would be handy to carry packets or tetra packs with them than running with bottles or cans all day. Or they can even think of having Cola cans similar to the tea cans which can be used as a mobile fountain machine, and can be taken from coach to coach to reach more customers and serve them in the typical Indian small standard. As the competition is getting fiercer and volumes are dipping, it would be necessary for the Cola majors to come up with innovative ideas to boost the sales than just spending all the moolah on ads with Miss Worlds and macho men of India. – I am not sure if PET bottles are not so mobile. You do see a lot of people carrying them around. – They are sold as aggressively as a tea/coffee You will see them in trains when the vendor walks into the cabin with a bucket full of ice and these bottles are loaded inside. Keeping them cool while mobile too. – Another good thing for cola companies would be to sell them from mobile units. one such good example I can think of is: The boys who sell bisleri mineral water bottles at signals during the really hot days specially during the peak hours when people are on their long drive back home. I think tetra packs would be quite a cool idea. They’re very handy to carry. Take Appy Fizz for example..very popular.. But yes, I do agree that colas should look deeper than rolling out expensive ads with the stars. Kapil, Chaudhuri – Thanks for your comments. Kapil, I agree Pet bottles are mobile, but then it’s available only from the 500 ml. range. So I felt it would be better to try other modes of providing mobile cola which can compete with tea/coffee.